Nursing homes should provide a safe and caring environment for all residents, but they often fail to take proper care of the very people they are supposed to protect from harm. This inadequate care frequently goes as far as failing to provide the basic necessities for human lifeâ€”food and water. When nursing homes fail elderly and disabled residents, the attorneys at Solomon & Relihan hold them accountable. 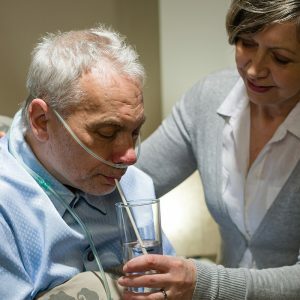 In nursing homes, water deprivation is an all too common problem â€“ but it should never happen. When it does, it can cause weakness and sickness, increasing the risk of infection and sometimes leading to death. Dehydration can result in confusion, which may be misdiagnosed as dementia, and can cause other conditions such as urinary tract infections, skin breakdown and kidney failure. Although dehydration can occur anywhere, in the Southwest it can be particularly dangerous because of the dry and hot conditions. Nursing homes should insure that adequate beverages are available and that your loved one drinks them. Families visiting nursing homes may often spot dehydration by examining their loved oneâ€™s skin. Skin that does not rebound when pressed may indicate lack of water. If someone you care about has been abused or neglected in a nursing home, take action. If your loved one is dehydrated, this is a serious sign of neglect. Dehydration is a significant problem and it may indicate that the nursing home staff is lax in other areas of care as well. Speak with an attorney who has experience in nursing home law about your options.